This condition seems quite obvious - any break or crack in a bone is considered to be a fracture. When a broken bone punctures the skin it is called an open, or compound, fracture. This type is more serious than a simple, or closed fracture. Any fracture requires immediate medical attention. When a bone fractures, it triggers not only pain, but bruising, swelling and immobility. The trauma and shock travel through the whole body. Fractures located near joints are sometimes misidentified as simply bad sprains. When bones receive more pressure than they can withstand, a fracture occurs. Some of the more common causes are falls, car accidents and sports injuries. A continuous pounding on the feet from running can cause thin breaks (called hairline fractues) in the feet, shinbones, ankles and hips. Osteoporosis, a weakening and thinning of the bones, can increase the risk of fractures. Partial - When the break across the bone is incomplete. Complete - The bone is broken into two pieces. Comminuted - The bone is splintered at the broken area and many smaller fragments of bone are between the two main pieces. Greenstick - This type of fracture occurs only in children and has one side of the bone break while the other side just bends (typically in the radius, or forearm, bone). Spiral - When a breaking force has twisted the bone apart. 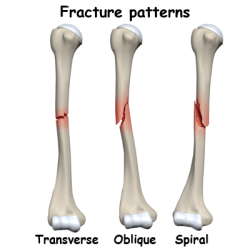 Transverse - A fracture that occurs at right angles to the bone. Impacted - When one fragment of bone is forcibly driven into another. Nondisplaced - When the correct anatomical alignment of the bone is maintained. Displaced - The correct anatomical alignment of the bone is not maintained. Stress - A partial fracture due to the bone's inability to withstand repeated stresses (such as the stress of performing aerobics or running). Pathologic - The result of normal stress on a weakened bone. This type of fracture usually occurs from a disease such as osteoporosis, osteomylitis, osteomalacia or neoplasia. When playing sports, wear protective gear. Common sense should be used to guard against accidents at home. Eliminate clutter on floors to avoid falls, and use handrails when climbing stairs. Repair broken steps and walkways. To reduce the risk of osteoporosis, be sure to consume enough vitamin D and calcium from either the diet or supplements. Engage in weight-bearing exercises regularly, such as weight lifting and walking. A misshapen or swollen limb after an injury may be fractured, as can a joint that will not bear weight. A physician who makes use of an X-ray can make a definitive diagnosis. An MRI or CT scans may also be needed to see tiny details of joint fractures and damage to the tissue surrounding the injury. If a closed bone fracture is suspected, seek immediate medical attention. A closed fracture can frequently be treated in the doctor's office. Open fractures are medical emergencies. Aspirin or other non-steroidal anti-inflammatory agents should not be taken to relieve pain from fractures because they may promote bleeding. Instead, apply an ice pack to the injury. For most closed fractures, immobilization is the main type of treatment. A splint or cast is typically used to hold the broken bone in place until new bone grows to heal the injury. A sling may be enough for a fractured elbow or shoulder. Surgery may be required for open fractures to clean the broken bone and surrounding tissue. When multiple breaks are involved in either open or closed fractures, stabilization surgery may be needed by fusing the bones with pins, metal rods, screws and plates. Traction is sometimes required. The fractured limb is held taut with pulleys and ropes to keep the bone properly aligned as it heals. When children are suffering from fractues, traction may be preferred instead of surgery to ensure damage is avoided to the growing tissue at the ends of long bones. Traction may be used in adults before surgery or casting to help improve the odds of successful treatment. Antibiotics - To prevent infection from open fractures, antibiotics may be used. Physical Therapy - After the bone has healed, physical therapy may help restore range of motion and function. Magnet Therapy - In North America and Europe, pulsed electromagnetic fields are widely used to help heal leg fractures. Supplements to try include boron, vitamin C, silicon, zinc, soy protein powder and strontium. A good diet is also beneficial. Eat foods high in calcium and the nutrients needed for the assimilation of calcium. 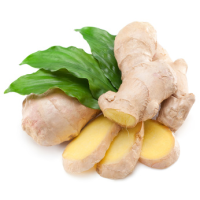 Sea vegetables, green leafy vegetables, nuts, soybeans, molasses, salmon, oysters, sardines and broccoli are helpful. Avoid foods such as refined sugar, refined grains, and sodas. All of these contribute to bone loss. Because high salt intake also is linked to bone loss, avoid processed foods and do not add table salt to meals. Cut down or eliminate the consumption of caffeine products and alcohol as they also contribute to bone loss.